Missouri has seen a substantial drop in the proportion of homes with a second mortgage, equity loan, or both between 2009 to 2016. In 2009, 14.09 percent of all homes in Missouri had a second mortgage or equity loan—that number reduced by more than half to 7.14 percent in 2016. How Much Do Pennsylvania Homeowners with a Mortgage Spend on Housing? Gavop used data from the United States Census Bureau to analyze the proportion of income that homeowners in Pennsylvania spend on housing costs, especially those with a mortgage. Overall, Gavop found that Pennsylvania homeowners spend 29.9 percent of their income on housing costs, which is just one percent lower than national values. A recent study by Gavop analyzed the proportion of income that is spent on housing costs by homeowners with a mortgage in Massachusetts. The cost of homeownership is the percentage of income allocated to expenses such as mortgage payments, real estate taxes, home insurance, and utilities. Gavop’s latest study shows that over half of all homeowners in Alabama have used mortgages to help finance their house. As of 2016, 56.61 percent of homes had a mortgage or other debt and 6.37 percent of homes had a second mortgage, equity loan, or both. Gavop analyzed data from the United States Census Bureau to to confirm the proportion of mortgaged homes at the county, state, and national level. A recent study conducted by Gavop using United States Census Bureau data clearly shows that in the state of Texas, the number of mortgaged homes decrease as the mortgage holder’s age increases. In general, as people grow older, they are able to accumulate more money to pay off mortgage debt, as opposed to younger adults who may be on their first or second homes. Are Mortgaged Homes A Sign of High Income in New York? Most of the mortgaged homes in New York belong to households that have an annual income of over $100,000. In fact, the number of mortgaged homes belonging to households in this income category has increased from 2009 to 2016 while mortgaged homes for household incomes of under $50,000 and incomes between $50,000 and $100,000 have decreased. Gavop used data from the U.S. Census Bureau to create a county-level analysis on the expenses of homeownership for those with a mortgage in Texas. The study looks at the percentage of income spent on housing costs, including mortgage payments, real estate taxes, home insurance, and utilities. 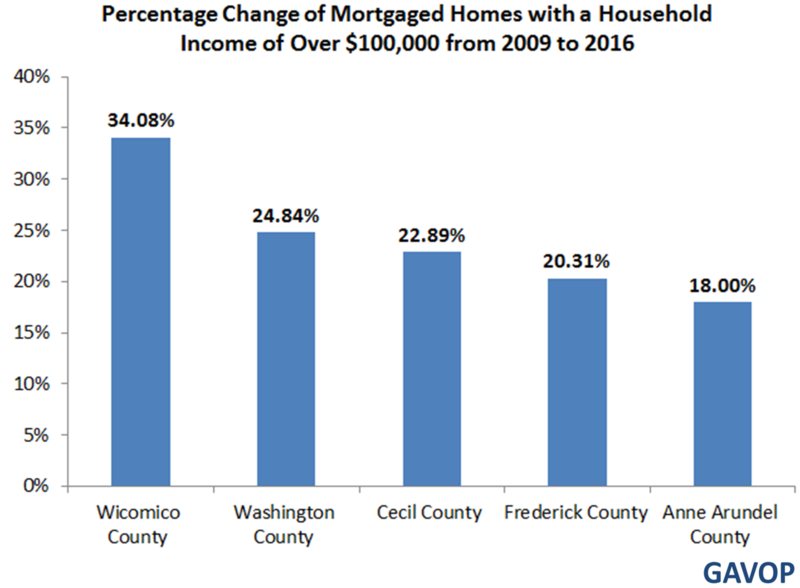 The largest proportion of mortgaged homes in Maryland came from homes that took in over $100,000 per year. Specifically, 54.79 percent of households of the over $100,000 income level had a mortgage on their home in 2016 compared to 29.52 percent for households with an annual income between $50,000 and $100,000, and 15.68 percent for households with an annual income below $50,000. A recent study conducted by Gavop using data from the U.S. Census Bureau analyzed the expenses of homeowners with mortgages in the state of New Jersey, at both the state and county level. The cost of homeownership is the income allocated to expenses including mortgage payments, real estate taxes, home insurance, and utilities.